File photos Bluegrass and Brews is scheduled to begin 4 p.m. Friday, Aug. 3. Mark Whitt and True Bluegrass, Clay Hess Band and Restless Leg String Band will each perform. Pictured is a performance from last year’s event. FAIRBORN — The City of Fairborn is hosting its second annual Bluegrass and Brews event and will include three bluegrass bands, 14 food trucks, family-friendly activities, a beer garden and wine. The event is slated to begin 4 p.m. Friday, Aug. 3 on Main Street and is free to attend. Bluegrass performances include Mark Whitt and True Bluegrass, who will take the stage from 4:30-6 p.m.; Clay Hess Band, who will perform 6:30-8 p.m.; and Restless Leg String Band, who will close out the event from 8:30-10 p.m.
Food trucks in attendance will include EAT Food Truck, H&H Kettle Corn, N&H Food Truck, Southern Sisters, Waffle World, FlyBy BBQ, L&L Concessions, Kleinfelder Hots & Brats, Crossroad BBQ, Son of a Biscuit, Under Dog Mobile, Reubens & More, Simply Sweet and Harvest Mobile. The beer garden will be located at 5/3 Commons on the corner of Main Street and Grand Avenue. Those who pop open a cold one — or enjoy a glass of wine — at the event will not be permitted to leave 5/3 Commons with drinks in-hand. If an individual were to step outside the area with alcohol, they could be ticketed for an open container violation. Individuals are also not permitted to “bring their own beer.” According to the Bluegrass and Brew’s website, bluegrassandbrew.com, alcohol can be purchased via drink tickets at the event. 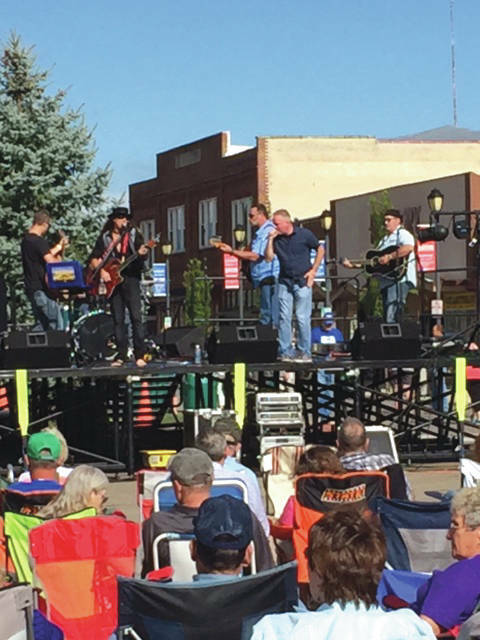 https://www.fairborndailyherald.com/wp-content/uploads/sites/50/2018/07/web1_bgb3.jpgFile photos Bluegrass and Brews is scheduled to begin 4 p.m. Friday, Aug. 3. Mark Whitt and True Bluegrass, Clay Hess Band and Restless Leg String Band will each perform. Pictured is a performance from last year’s event.